Kerry Klingler, head of Quantum Sails J/Boat Division, credits a lot of the success of the teams he sails with on proper jib trim. Read on as he demystifies jib trim for ultimate performance. 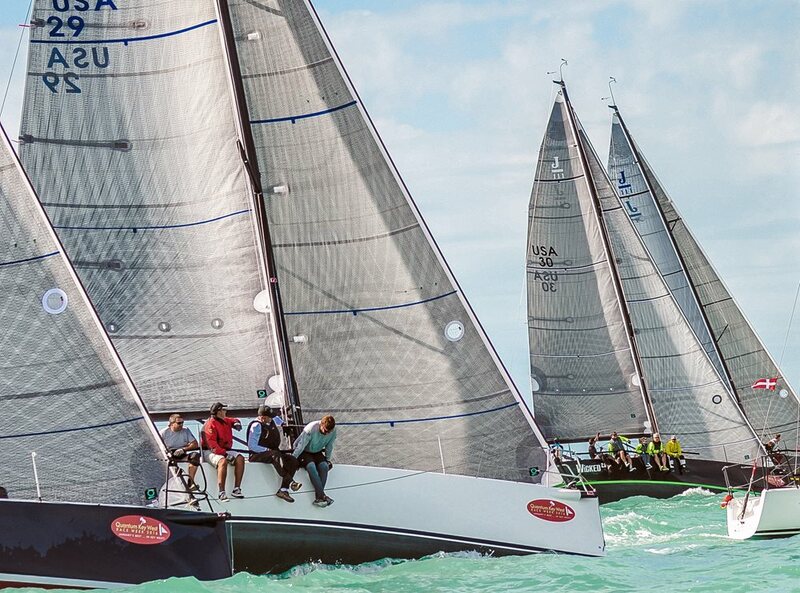 Beautifully Trimmed - J/111s dominate at the 2016 Quantum Key West Race Week. Photo by Sara Proctor. As the J/Boat team leader for Quantum Sails, I spend a lot of time racing with customers on current J/Boat models. Many of these boats have non-overlapping jibs with controls for sheeting the jib. The main controls are jib sheet, halyard, jib track, and inhauler. So what are the basics of getting the most speed and height out of the boat? Creating a point-of-reference is critical for getting the most performance possible. Start by sailing the boat and marking trim locations. I like using light colored line so I can mark the line with a sharpie. Mark the spreaders for leech position, inhaulers, jib car location, and jib sheets. These marks make it easy to quickly duplicate the fast locations. This is a great start, but follow up with some thread and a needle to make the marks more permanent after you confirm the placement. The next thing to consider is the power in the adjustments. Adjustable jib leads are important, but under load they still can’t be moved, even if you pull as hard as you can, so make sure you have enough mechanical advantage to adjust the jib leads and inhaulers. On the J/109, we changed from a 4:1 to 6:1 purchase system. That let us adjust the lead in 20 knots. The line you use is also important; use low-stretch line for these adjustments. Spectra core is the way to go. Placement is also important. I like the inhauler control to be on the windward side of the boat. By having it there, you can ease out the inhauler while still being on the windward rail. Now that you have your boat setup with repeatable and easy-to-adjust settings, fine-trim the sail. For most J/Boats, set the inhaulers on the outside edge of the handrail, about eight degrees off centerline. Set the halyard to take the wrinkles out of the luff of the sail. Set the jib leads as far aft as possible with the luff of the sail breaking evenly. If the top of the sail breaks first, move the lead forward; if the bottom of the sail breaks first, move the lead aft. Finally, trim the sail so the leech tell tales are not flowing, then ease the sheet until they start to flow. When you get to this stage, work through the trim loop again – check halyard, luff break on the jib tell tales, and sheet tension. One of the most common mistakes I see is a flat foot when trimming a jib. That’s okay if the luff is breaking even; however, if the lower tell tales are stalled with the upper tell tales flowing, it’s likely that you’re not maximizing your speed. Use the tell tales as your guide, and don’t worry about the fullness of the lower sections of the sail. Also, remember that most of these classes have a limited number of jibs – usually an AP (or J1) jib and a heavy jib, which can be a J2 or J3 design. That means there has to be a fair amount of adjustment for the sail to be effective through a wind range of 15 knots. The biggest adjustment is sailing into light wind. Let’s say you’re sailing upwind in 8-10 knots of breeze. You have everything sheeted perfectly when all of a sudden the wind dies to four knots. The result? The jib is now over-trimmed, you’ll need to ease the sheet. Adjust the jib halyard next, giving it a slight ease. Next, check the luff of the sail. Is it breaking evenly? If not – even in the light wind, even with the lead forward – go ahead and ease the inhauler. This will shift the lower section of the jib outboard and make the sail fuller. At the same time, sheet tighter with the upper leech tell tales still flowing slightly. This should help your light-air speed and make it easier for the skipper to keep the boat moving. Suppose you’re trimmed perfectly in 18 knots of wind – the backstay is maxed out, the main is as flat as possible and slightly depowered, the inhauler is outside the handrail, and the jib leads are aft with the luff breaking even. Then the wind increases to 22 knots. Ease the inhauler to three inches off the rail, burp the main, and sail through the puff. If the wind increases and stays heavy, try dropping the lead aft another two inches and let the top of the sail break first. The key is to keep speed on the boat and not heel too much. By keeping the boat flat and fast through the water, the keel will work for you and develop lift, helping the boat to point. Rig tension has a huge effect on sail shape. The tighter the rig, the flatter the jib; the softer the rig, the fuller the jib. Learning how to adjust the rig for different conditions can yield big results. If you’re sailing in a one design class, ask your sailmaker for a tuning guide, and don’t be afraid to use it. Your sailmaker can also help advise you on how to make adjustments. Getting your boat set up with the proper rake and pre-bend in the spar is critical. Working the rig setting for more or less wind can make the difference between a finish on or off the podium. Have a question for Kerry? Email him at kklingler@quantumsails.com or ask our team of experts any question in our Ask the Expert portal. Good article. I'm able to adjust the mast rake and backstay on the fly on my C+C 35 and it helps to soften the rig and bow the mast a bit in light air, gives more fullness to the sail shape.